Clear Decals are sometimes also called Window Decals. We offer these decals in custom and standard shapes and sizes. You can also print these decals in Full Color Print or in Spot Color print. 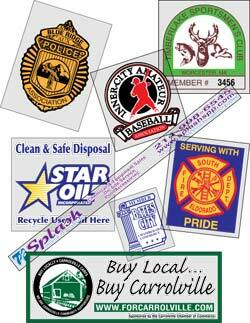 Either way, Denver Decal uses high quality long lasting material. Along with great material we also uses a high quality printing process using only UV ink to ensure a long lasting print that stands up to even the worst elements of cold or heat. Clear Decals can be printed on 1 of 3 material types. Permenant Adhesive, Static Cling, or Temporary Adhesive.Whichever you choose, you can get a look of clear and crisp print but the non printed part will show clear. Each one of these types of material offer quality and durability. Static Cling use No adhesive at all, while there are also a permenant and removable adhesive application. We offer a full line suit to fit your needs best. Shipping: Most Clear are shipped in 4 to 5 Business Days!